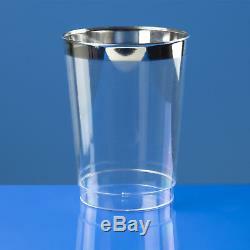 300x Strong Disposable Plastic Tumblers /Glasses - With Elegant Silver Rim. 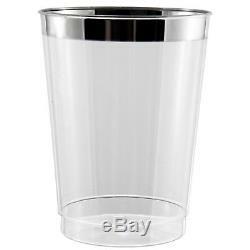 300 x 10oz/284ml Clear Hard Disposable Plastic Tumblers, with Elegant Silver Rim design. 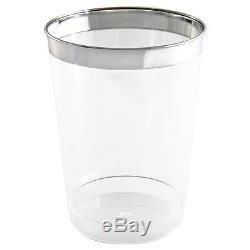 These disposable tumblers are made of quality plastic and won't crack easily under regular use. Ideal for catering, restaurants, wedding, parties, bars, conferences, business use.. The best quality in formal disposable plastic dinnerware. 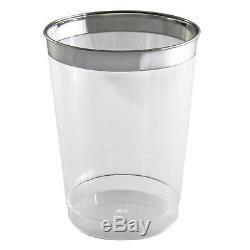 Great plastic tumblers for parties, in the office, weddings, or a picnic. Washable by hand and can be used more than once. Can be used for hot and cold food - very durable. 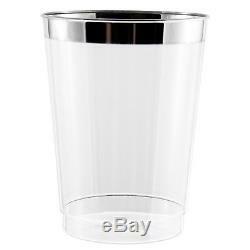 Pack Size: 300 Tumblers Capacity: 10oz (284ml) Dimensions: Top Diameter: 7 cm (2.7") Height: 9 cm (3.5") Material: Durable Plastic Colour: Clear Heat Resistant: Can hold hot foods Microwave/Freezer Safe: No Packaging: Clear Plastic Box. Please see listing specifics for further details. Generally all items are sent using Royal Mails 2nd class service. This will be advised prior to dispatch. Mashers has over 40 years experience in the disposable tableware industry, and has expertise in supplying both the retail and wholesale markets. Mashers serves its customers online and directly from our warehouse and retail shop in Manchester, England. 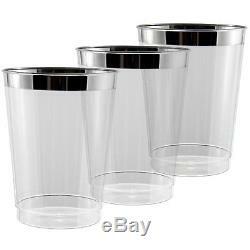 Our disposable goods range includes all types of plastic and paper housewares, kitchenware, and partyware such as. Plastic and paper plates in many designs and colours. Plastic cups both economy and heavy duty. Mini Plastic Tasting and Canape Dishes/Containers. Disposable Tablecloths and Organza Table Runners. Paper Napkins in many sizes, colours and designs. Tin foil aluminium Trays in all shapes and sizes. Plastic Bags for personal and business use. Foil platters, foil containers, plastic platters etc. We do our utmost to ensure that your goods are packed well and arrive intact. (Photographic evidence may be required). The item "300 x 10oz Clear Tumblers/Glasses in Strong Disposable Plastic Shiny Silver Rim" is in sale since Thursday, November 3, 2016. This item is in the category "Home, Furniture & DIY\Celebrations & Occasions\Party Supplies\Party Tableware". The seller is "mashers_disposables" and is located in Manchester. This item can be shipped worldwide.